Science v humanities: a matter of presentation? I attended two very different seminars in college today and the differences were striking. The first seminar was titled ‘Academic Freedom and the Notion of Rights’, and was given by a visiting lecturer in philosophy. He talked for an hour on the subject of rights, perceived rights, fundamental vs non-fundamental rights etc …and in the last ten minutes touched on the issue of academic freedom within this context. Basically, it was a long and detailed talk without any visual aids on the philosophy of human rights, with a little bit on academic freedom thrown in at the end. (The talk was followed by a response, a much shorter talk by the Technology Transfer Officer at our college. This speaker gave a short, pointed talk on the concept of academic freedom, using several well-known cases in the news as examples. I liked this talk better, but again it was hard to make out the central point of the argument and there was no attempt to elucidate points with diagrams, pictures or slides). After lunch, I attended a very different talk ; a seminar on recent research into gene therapy in plants by Prof. Liam Dolan, Sherardian Professor of Botany, University of Oxford. Now, I know as much about plants as you do about astrophysics, but the lecture was clear, well-laid out and easy to follow. The speaker made great use of simple pictures and excellent overheads, and explained the basic concepts of his field and the relevance of his research to society in exemplary fashion. At no stage were we bombarded with information, yet I came away knowing good deal more than when I arrived. You can see the abstract for Liam’s talk here. So there is the difference. One speaker renders an obscure, complex subject simple by presenting it in a clear, coherent manner – another presents an interesting, relatively simple topic in convoluted terms, rendering it far more complicated than necessary. Could it be that scientists tend to be clear because they have to be? The subject is difficult enough as it is and swiftly becomes impenetrable if not clearly explained. A colleague has suggested that ” we may have become used to visuals and it can be a challenge to listen attentively for 40 minutes”. It’s a fair point but I didn’t feel challenged. In fact, I think the narrative style allowed the speaker to repeat himself at regular intervals in a way that would become much more obvious if visual aids had been used! As they say “A picture speaks a thousand words”. Maybe there is truth in it. 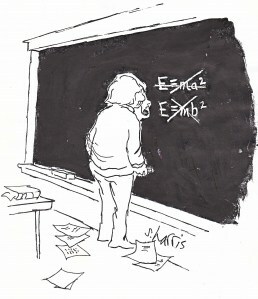 Pity cosmology and particle physics aren’t as simple……. Hmmmm…. or are they? Is it more typical of science or of the humanities to make sweeping generalisations on the basis of a microscopic sample? Valuable information. Fortunate me I discovered your website accidentally, and I’m shocked why this accident didn’t took place in advance! I bookmarked it.